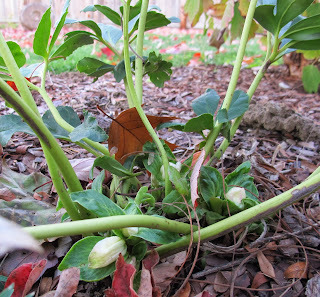 Welcome to Garden Bloggers' Bloom Day for November 2013. Here in my USDA Hardiness Zone 6a garden in central Indiana, winter made a guest appearance a few days ago with a good dusting of snow on the ground. It was one of those snows that looked like someone sprinkled powdered sugar on the grass and garden, but left the roads alone. In other words, people from places like Austin, Texas would have freaked out if it had been on their gardens. But here, we just took it in stride. A day or so later, I took a quick tour around the garden and found a few blooms including this mysterious goldenrod that is blooming rather late. I've decided it is not the same Solidago shortii that I planted elsewhere in the garden that is all bloomed out and cut back now. I've also decided that based on where it's growing, it isn't likely to be some wild seedling. I must have planted it, right? I assume I did and now I am curious which goldenrod it is and whether or not I should expect it to bloom this late every year. I'll spend some time this winter looking through piles of plant tags to see if I can figure it out. Elsewhere in the garden, I found some color in the rose hips of Rosa 'Meiboulka' which is sold as Oso Easy® Cherry Pie Rose. They aren't exactly blooms, but won't they be pretty with snow on them? I also found some buds in the garden. This Colchicum bud is from a bulb that I planted just a few weeks ago. It was a little late to plant Colchicum bulbs, but I got them in a close out sale. They won't bloom this year, in spite of this bud, but should bloom next year. The buds that will bloom this year are those on the Christmas rose, Helleborus niger 'Josef Lemper'. I'm looking forward to seeing these blooms in the weeks ahead, aren't you? What's blooming in your garden in November? We would love to have you join in for Garden Bloggers’ Bloom Day and tell us all about what is blooming in your garden this month. 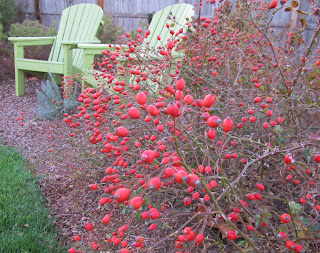 Thanks for hosting the GBBD again Carol, your November garden looks beautiful, what an amzing colour on those rose hips! Lovely autumn blossoms. Happy Bloom Day! It is only spring that i've experienced from the four seasons. I am not particularly interested for the winter but i so much want to see autumn, plus the frosts you mentioned here, and i always see on blogposts. Oh how i wish i can also get macro shots of them. Yes they would be spectacular with your red rosehips! Would be amazing! 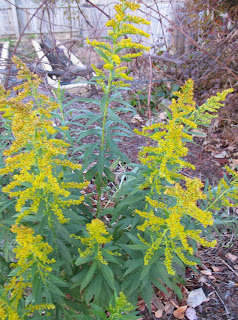 Interesting to see Goldenrod blooms in November. Beautiful rose hips! Carol, do you have any houseplants? Hi Carol, thanks for hosting GBBD. Those rose hips do look good, a real splash of colour. What a difference a month makes, first frost here too. The rose hips are stunning, and I think they'll only be improved with snow on them! we've had frosts too - great rosehips - mine haven't coloured up so well on some roses this year. No snow here yet Carol, but the forecast says winter is due for a visit over the weekend. A real challenge to find colour this month. An intriguing find with the goldenrod - I hope you track down the answer! To think a few years ago I didn't know what a hellebore was, and now, you're right, I'm waiting with pleasure for their arrival. Well what a happy bloom day Carol with those few blooms...my is all a dream as nothing is left blooming due to very cold weather and many freezes. We have had our first taste of winter as well with a freeze this week and a freak snow fall, though we had no powdered sugar here. It just melted as soon as it landed. I hope the coming change in the weather treats you and your garden well. Happy GBBD! All I have blooming is a Witch Hazel and a Thanksgiving Cactus. Happy GBBD. I'm looking forward to the Helleborus too! We just had a dusting of snow in New York. Thinking spring already! Happy GBBD! Wow! Look at all those rose hips! Just as pretty as any blooms! Thanks again for hosting. Happy bloom day...last couple of days we got hit with a cold snap but overall...things fared okay....I find this time of year the most interesting to see what winter colors have in store. Beautiful color on the rose, and a wonderful surprise goldenrod. 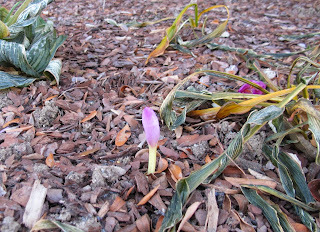 My garden has been brought from the outside in, which I wrote about in my blog today. Hm! A dusting of snow would have been OK. the 27 degrees we got the night before last was not. It was hurry up and get everything into sheltered places, greenhouse, shed, garage, house. Now 85 degrees Sat. That's the kind of weather that makes me freak out. So glad some of your plants survived the light dusting and thanks for sharing your blooms and hosting the day. Love your garden color representing past, present, and future flowers. Gorgeous. We've still got a few blooms here in the Pacific Northwest but the blooming bacchanal of summer is certainly over! Can't believe that November is half over already! Thanks for hosting GBBD again! I love the picture with the rose hips. 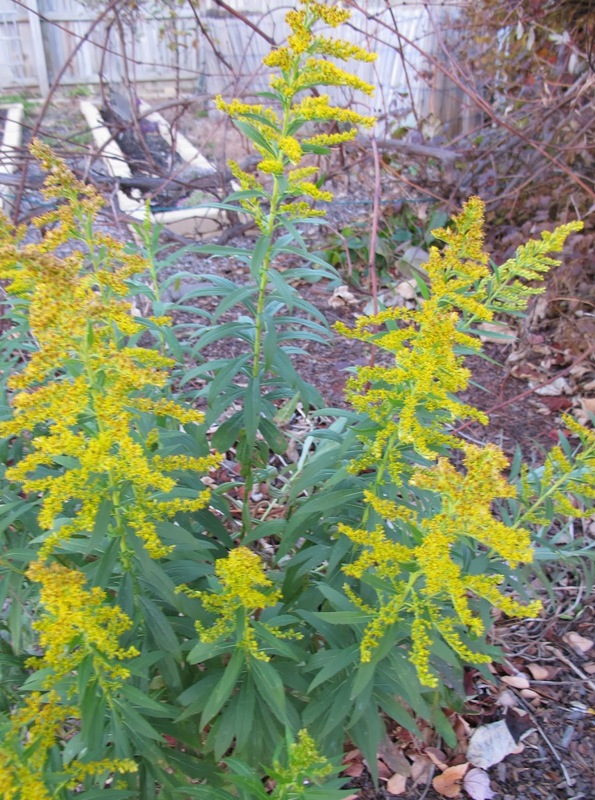 When you find out what variety of Solidago you have blooming so late in your garden please share with us! I didn't think to include the rose hips - of which I have a big variety - but my Thanksgiving cactus buds were feeling lucky to be included. Thank you for inventing Bloom Day! Thank you for hosting 'Garden Blogger's Bloom Day' and for the link to my blog Hoehoegrow. So interesting to see what s happening in other gardens around the globe. Your garden feels like early Spring! Lovely. I have 8 plants in my garden that still look good after bitter cold. Most of them are foliage only, but I have two flowering plants as well. 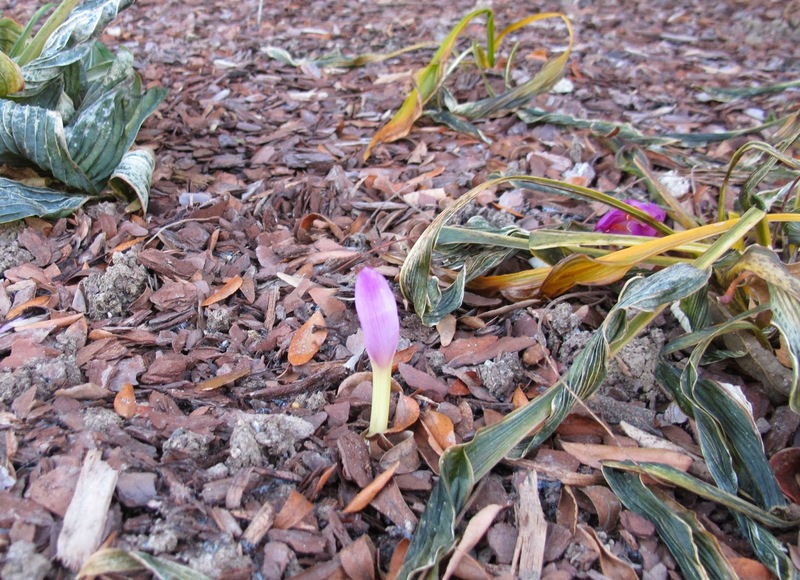 You never know, if you have a warm spell, that colchicum might bloom. The rose hips in your garden look as colorful as the flowers must have been. Happy GBBD, and thanks again for hosting! Very pretty rosehips - they would really stand out with a covering of snow wouldn't they. Frost but no snow here yet! If we saw snow on the ground here, TV news crews would be on the scene! Actually, we had a brief return visit from summer this week as our temps soared into the 90s but they're coming back down again. Thanks, as always, for hosting GBBD! Thanks for hosting - those rose hips are gorgeous and how lovely to see the first sign of your hellebores too! We got zapped by that same winter freeze this week, but only a few spots got a dusting of snow here in the Mid-Atlantic. Surprisingly, I still have many of my summer annuals in bloom, though we need RAIN for the rest of the garden's sake! We have been lucky in most of Portland, OR. No frost so far, and lots of blooms still brightening our gardens. I'm especially loving my Fatsia japonica blooms! Hey, you have great hips! Doesn't every woman want to hear that? Every woman gardener -- with roses, I should say. But really, a super display. Is it always like that? Those rose hips are amazing. None of my roses have ever produced such an abundance of hips. What a boon if you like rose hip tea! Carol, I'm trying to shift my appreciation to seeds and berries... but gotta love witch hazel for blooming now! And I'm envious that you have Christmas rose to look forward to! I don't know this rose but the hips are stunning. Hellebore buds in November are a surprise. I'm going to check mine tomorrow. Do you cut the leaves off in early winter? What an amazing fall day for garden bloggers! I love seeing all the late season color around the country. That Cherry Pie Rose is gorgeous, not something we see around here! Those rose hips against snow would be an amazing sight. I'm seeing buds on my hellebores too. The hips on rose Cherry Pie are fantastic. There's a way to find beauty in every garden in every season. Thanks for hosting GBBD! Those are some lovely rose hips! Thanks as always for hosting. Where did you find your hellebores? I haven't seen any here in the local garden centers and I think about planting them every year. Looking forward to seeing yours blooming! Thanks for hosting!! Hey, Hi! I am kinda new at this, but I found some flowers and got a post together. Thanks for hosting GBBD! Great to have a goldenrod still blooming. 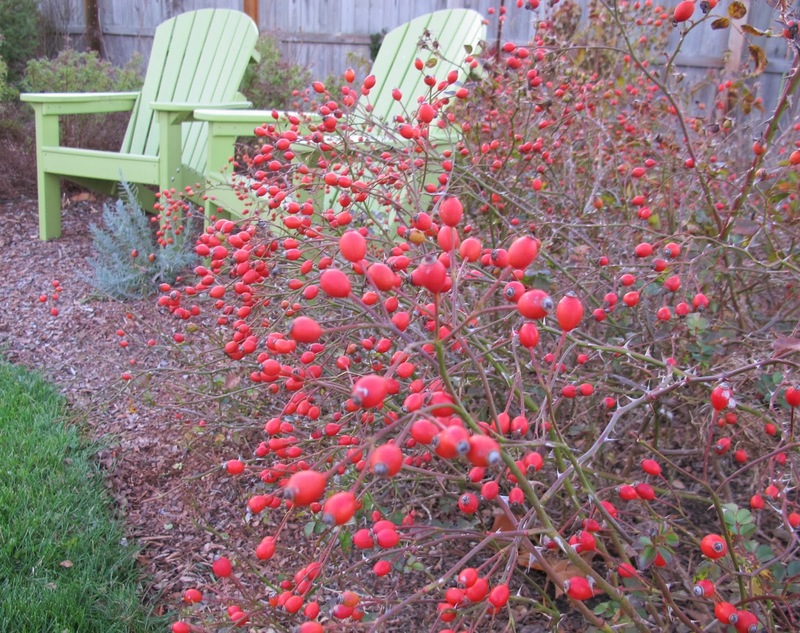 The rose hips are really abundant and colorful! I won't see any blooms on my Hellebores until late winter. I'm featuring a rose, Hydrangea, and Camellia. It is not normal for Goldenrod to be blooming this late. It's just out of sync. I had one oddball blooming last week too. I have a real Witch Hazel in full bloom in mid-November. Happy November Bloom Day, Carol! Hi Carol, Thanks for hosting once again. I managed to find some surprises outside but the wonderful thing for me has been discovering oxalis this year — what a flowering bonanza! Hello! We are in the same zone and yes, winter is happening here as we speak. It is supposed to snow all weekend. I'm just happy I got to join in this month--I wasn't expecting to have anything still blooming! I apparently made the wrong link on my first try, so I did another link to correct it. I agree, your rose hips are stunning! I had to search for flowers this month, but managed to find a few. I still love your Christmas rose, Helleborus niger, Carol! Beautiful rose hips! It almost makes you wish for snow to highlight them even more, doesn't it? The snow was light here, too, but the cold temps with it have really done a number on my garden. I'm still trying to figure out if I have anything worth sharing for Bloom Day. I am really looking forward to the blooms of that Hellebores Niger, too! Beautiful. You live in my dream zone 6. Those rose hips are gorgeous! It gets more challenging as the year draws to a close, but that just makes it all the more fun. Thanks for hosting.